(Nanowerk Spotlight) The controllable fabrication of highly ordered homogeneous nanostructures on surfaces remains a difficult challenge. Nevertheless, motivated by potential applications in micro- and optoelectronic devices, the problem of organic nanoscale structures on surfaces with long-range order and uniform size has attracted considerable attention in recent years. Researchers in Switzerland have now grown ordered arrays of fullerene nanochains on a gold surface. This demonstration constitutes a successful proof-of-principle for the concept of site-selective molecular anchoring on nanostructured template surfaces, and provides the perspective of fabricating complex supramolecular nanostructures being of potential technological relevance by site-selective anchoring and self-assembly methods using properly designed functional molecular building blocks. Dr. Roman Fasel, a member of the [email protected] group at Empa in Switzerland, explains to Nanowerk: " Our experiment shows that one can guide the self-assembly of molecules on specially prepared surfaces. Theoretically this is possible with a vast number of different molecules and surfaces. We only demonstrated that this is possible in principle by using one specific molecule/surface combination." 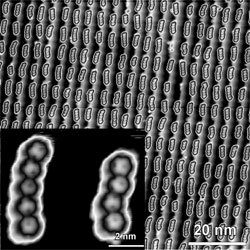 The research team from Empa and the Surface Science Research Centre at the University of Liverpool in the UK prepared gold substrates with a (11 12 12) structure – which naturally forms a rectangular superlattice – and sublimated the fullerene molecules onto the surface. 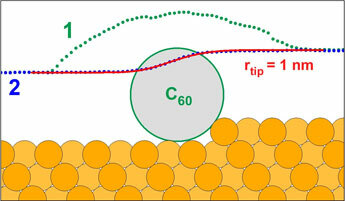 Using scanning tunneling microscopy and low-energy electron diffraction, they observed that the nanochains only formed at the lower step edges of the gold surface. The electron-rich regions near these edges are thought to preferentially adsorb the fullerene molecules, which are electron acceptors, leading to the formation of arrays that perfectly reproduce the periodicity of the gold template. Fasel is convinced it will become possible some day to use more complex molecules for the fabrication of nanoscale circuits to be used in nanoelectronic components. This research was reported in a recent paper in The Journal of Physical Chemistry B ("Formation of a Regular Fullerene Nanochain Lattice"). Fasel is also coordinating a European 6th Framework Program called RADSAS (Rational Design and Characterization of Supramolecular Architectures on Surfaces). This project aims at developing efficient strategies for parallel, two-dimensional molecular self-assembly on surfaces, which would be an indispensable prerequisite for the technical realization of supra-molecular design and engineering. It combines the specific knowledge existing in surface science with the most advanced methods of chemical synthesis to obtain supramolecular structures with unique electronic and transport properties, tailored to reflect the desired behavior in a wide range of technical applications. RADSAS partners are Empa, the Max-Planck-Institute for Polymer Research in Germany and the University of Liverpool.